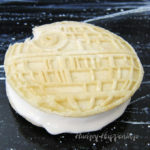 Sandwich a scoop of homemade, no-churn, maple ice cream in between two Kellogg's® Eggo® Star Wars Galaxy Adventure™ Buttermilk Pancakes to create these Galaxy Ice Cream Sandwiches. Pour heavy whipping cream into large mixing bowl. Beat on high until the cream holds stiff peaks. Add the maple syrup and sweetened condensed milk. Pour into a plastic container, cover, and freeze for at least 4 hours. Heat pancakes according to package instructions. Allow them to cool slightly then scoop 1/6th of the ice cream onto one pancake. Top with another pancake and press down to form an ice cream sandwich. Optionally, roll the ice cream sandwich in one of the toppings.